I’m having so much fun making these videos! We were home by 6:30….Jim had a friend over (and the friend brought his 9 year old plus 2 teens), we had my 13-year old nephew with us….so it was a full house of kids ages 8-13! We enjoyed pizza, beers (soda for the kids) and then had strawberry shortcake for dessert! Since we are all early risers (the adults at least, up around 5am) we called it a night early. Saturday morning as usual we slept in a bit (7:30ish). Jim had set a goal to start pressure washing the patio at 9:30, so I assembled another high-protein breakfast to keep him fueled. At 9:30 we went out and moved the patio furniture into the grass (including the giant heavy slate table- wowza) and he got busy. And he got dirty. He pressure washed the patio, the pathway, then the second patio, and the plastic shed, and the retaining walls, and the circle patio. 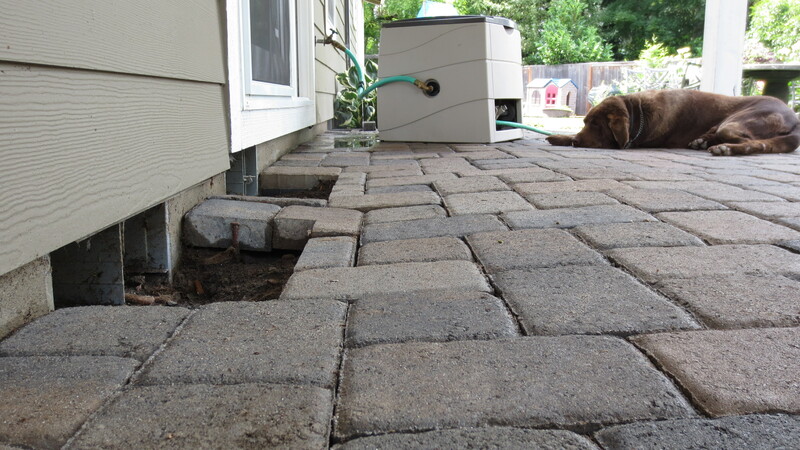 Now I get to spread sand back into the spaces between the pavers- and I think there’s at least 800 sf of patio…and it’s all missing the sand between the gaps! I’m sure you’ll hear more on that in a later post. 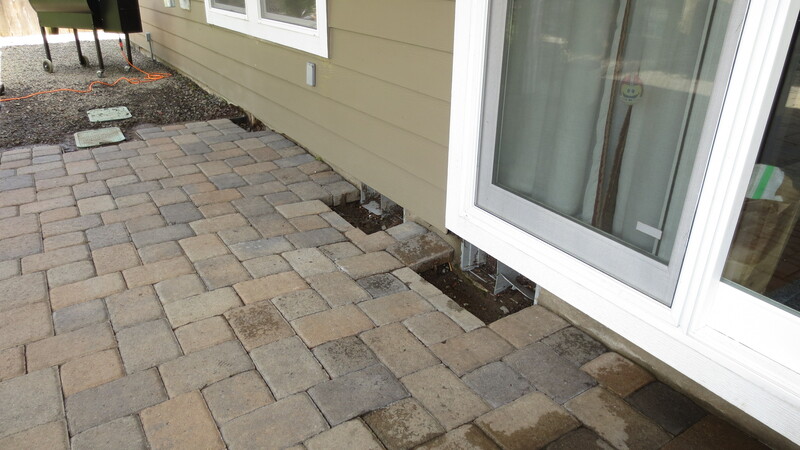 We also identified another project for me to do- the sinking and warped patio outside our back door. Maybe it’s a little clearer from this angle? 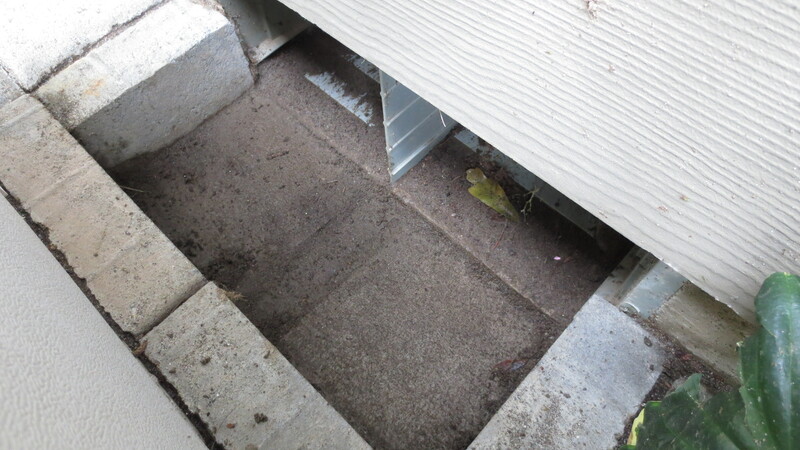 I think most of the problem is because of settling (the dirt around the foundation of the house) and the edges were never properly reinforced surrounding the vents, so everything is seeping into the vents and causing the whole thing to cave in. Much cleaner with reinforced sides! No caving in, no place for the sand to escape! Anyway, while Jim was pressure washing, I prepped a pork loin to smoke on the Traeger, then prepped to paint the front door- FINALLY getting that final coat on! And yes, it’s been seven weeks since I last painted it. That entire time I left my paint brush and roller in the fridge, tightly wrapped in saran wrap- and they were just as good as if they’d only been in there for a few hours! I was surprised, and pleased of course! But now the door is officially finished! 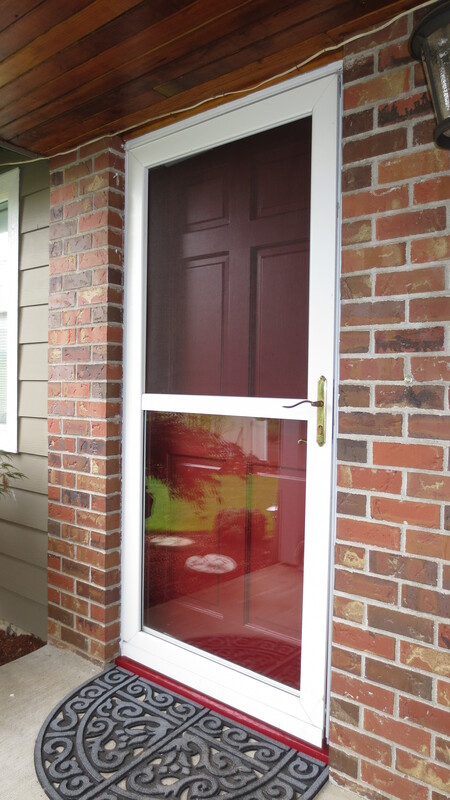 Sadly, it still doesn’t look very red when the screen door is closed. As the paint dried and the pork loin smoked, I worked on our home budget and financial reports…sad to report that my income for the month of June was NEGATIVE $172. Yep, NEGATIVE. And that’s not counting expenses, that’s only counting the cold hard cash that parents pay me. I get paid on the 26th for the following month, and since I’m closed for July that means I won’t have a payday this month. Zero dollars. And the income shows a negative because I refunded deposits to two families. I can’t wait to see what the REAL net amount is for the month after all my business expenses are calculated (meal expenses, insurance, I bought $182 worth of playpens last weekend!! !, etc.). It’s going to be a shocker I’m sure! I’m truly blessed that I don’t have to work. My income pays for the fun stuff- like Disneyland, yard decor, new furnishings, camping trips, kids sports & activities. It doesn’t impact our monthly living budget. WHEW! Anyway- Trevor and Riley spent the afternoon with Trevor’s friend Chelsy, and Brooke spent her time reading and following me around as I worked on the door and checked the pork loin and typed this and cleaned the kitchen and washed our bedding. The usual craziness in my life. 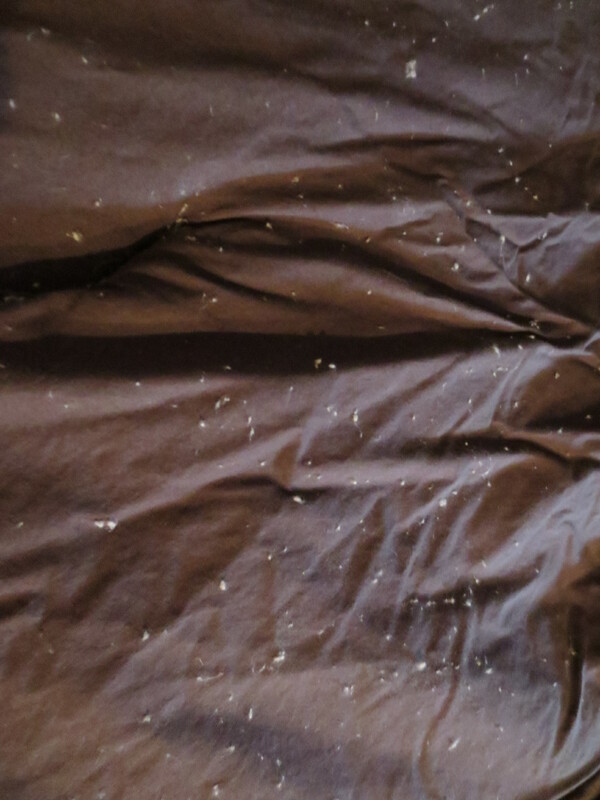 As if we don’t have enough things to do, we lay our king sized comforter out on the floor and used tape to pull up all the little pills of fluff that stuck to it last year when I put a new blanket on our bed. I tried washing it (twice) and drying it (twice) with no luck. So 4 hands and a giant roll of tape….. 30 minutes later it was clean. That was a fun task….not. Oh, the pork loin was DELICIOUS. I’ll post that recipe later. Sunday we spent the day planning next weekend’s projects- which will be emptying the storage shed so we can install additional shelving and storage solutions before filling it back up. The other project will be reinforcing the play structure. The bottom cedar boards have rotted, so we’re going to replace them with pressure treated boards. They’ve always been buried by cedar chips so makes sense to use moisture resistant wood for that area. Should be an interesting project as we need to cut dowm some of the damaged posts and I’m not sure how that’s all going to work out yet. So we headed out to Lowe’s and Home Depot to pick up the necessary supplies. Came home, Jim and Trevor worked on a couple non-related projects- one was repairing a piece on Trevor’s scooter. The other was reinforcing the base of the dog house. 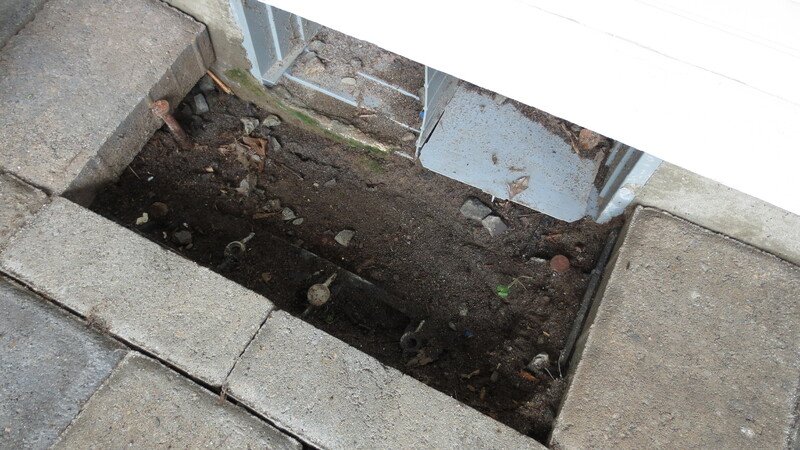 It has also rotted and is decaying, so Jim built a new base using pressure treated wood and lifted their house a bit. While they did that, I spent a couple hours re-writing my policy handbook and parent agreement and cover letter to reinforce that the goal of Room 2 Grow is to create a balance that meets the needs of working families, with the need for children to feel closely connected to their parents and siblings (my own included!) I’m a firm believer that parents should only have their children in childcare on the days it’s actually needed. That’s another topic I’ll save for later. I have a couple interviews lined up for next week, so wanted to make sure I had everything together. The kids started their reading program last week, Brooke has already read five “Junie B. Jones” books and wants to read the whole set. She read 1-4 and then #6. The library didn’t have #5, 7, 8 or 9, so I had to reserve them from a different library. We did check out #10, 11 and 16. She’s upset about not being able to read them in order, though. Riley chose a really big book and is about 1/3 of the way through. We have a lot of things coming up, rapidly, and possibly too many things on my plate, but I feel good about it. Stay tuned! I bet Safari Sam’s difficult course would be no problem for Trevor and Riley no with all their Parkour skills!